I often get contacted by photographers frustrated and complaining "my inkjet prints don't match my screen display". Sometimes they have spent significant sums of money having prints made and when they receive them from the printer they look dreadful. Sometimes it might be the fault of the printer but in most cases the photographer is at fault. Even if they aren't, they seldom have the understanding of the problem to defend their corner and have the images re-printed. 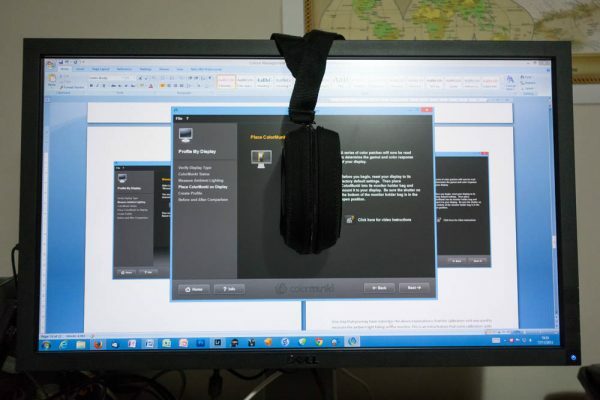 Monitor calibration ensures that the image you are editing displays correctly on your computer screen. White from the image will be displayed as white, black and black and all the colours will be accurately represented. Once you are confident of this you can confidently edit your images. If the image appears wrong on your screen display you will know that you need to correct it with image editing software such as Photoshop, Lightroom or Elements. When purchasing a calibration device be sure to pick the correct one. Most if not all will calibrate your monitor. If you want to be able to calibrate a printer, many devices won't help you. Printer calibration units are usually more expensive. Personally, I used to use the Eye One but switched to the ColorMunki Photo when I decided I wanted to be able to create printer profiles. Software only solutions won't really work and be wary of anyone claiming to be able to remotely calibrate your monitor for you. Invest your money instead in one of the screen calibration tools. Once you know that your image is accurately represented on the screen and that you want to print it, you need to ensure your printing software is set up to print using the correct printer profile. 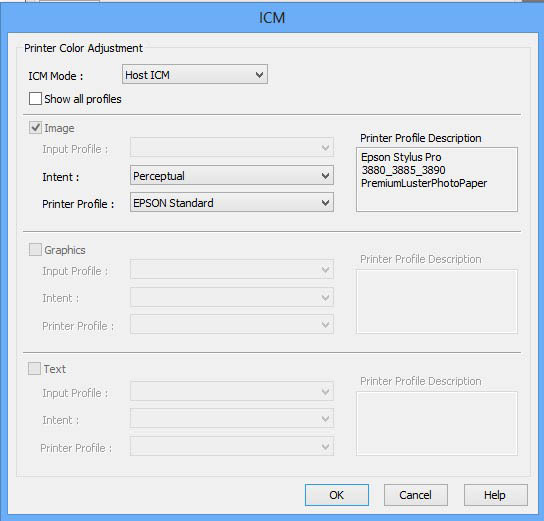 The printer profile is unique to a printer and paper combination. Select the wrong printer or use the wrong paper and you will find the print comes out wrong, sometimes very wrong. The other potential problem here is that the software used to print the photo isn't correctly configured to use the profile and/or the printer driver isn't correctly configured to take instructions from the printing software. 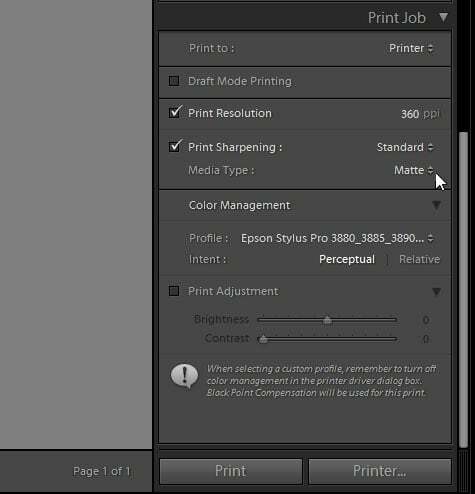 Typically you will need to set up the printing software (for example Lightroom) to use the printer profile and the print driver to not perform any colour management, because it's being done by the printing software. The printer profile also comes into play when you want to soft proof your image. A soft proof is a rendering of your image on the computer screen that simulates how the final print will appear. Typically people don't sent up the soft proof correctly and miss out the options to simulate paper and ink. When you pick the option to simulate paper and ink it will often make the soft proof on screen look terrible. If it does, you know your print will look terrible. To overcome this you will need to make adjustments to the soft proof image in order to make it look like the original image, before you print it. Typically this involves adding more contrast and saturation but you might need to make other adjustments. 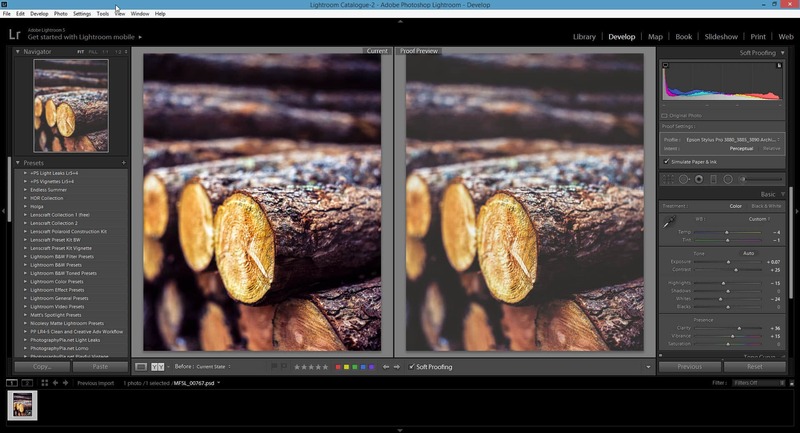 If you use Lightroom for this it has a great option to display the original image and soft proof side by side. This makes it much easier to edit the soft proof so that it matches the original photo. Whilst there are other problems that can arise, if you have done the above you will remove most of the sources of poor printing. You need to follow the book right up to the end of soft proofing. Be sure to do your soft proofing using the printer profiles provided by the lab. Once you have made your adjustments under soft proofing conditions save the adjusted file and be sure to send that one to the lab for printing. Also take a look at the past newsletters in the Members Area where I covered this very subject. Good luck. I have had this problem and have been looking at monitor calibration hardware. I am worried by some reviews that say they have ended up with, basically, screwed up screens showing wild colour casts. This has put me off trying (not being IT literate (technically). I don’t want to waste my time or money. I have a Dell All-in-one 2350 (1 year old)with a lovely screen and I want to keep it that way! I have never experienced a calibration problem although theoretically it is possible if the hardware isn’t working or used properly. I did have someone contact me once saying they had experienced this problem but when they sent me an example image it had a dreadful colour cast. The fact they said this image used to display correctly points to their monitor being out of calibration and having now been corrected. At the end of the day the colour profile is simply an information file and can be removed. Personally I wouldn’t be without a calibration unit and I think it’s essential for digital photography. Thanks for response Robin. I’m sometimes too cautious for my own good! Birthday coming up so might bite the bullet. No problem. I think its well worth the piece of mind to know your monitor is accurate.